Martilyo Gang strikes, causes chaos at SM CITY NORTH EDSA | Where is Ed Uy? Despite the presence of all those security guards and their oftentimes annoying “bag poking” security measures, suspected members of the Martilyo Gang were able to enter the premises of SM NORTH EDSA in a robbery attempt. The terrified shoppers were then evacuated to the parking lot and outside the mall. The Quezon City Police District said two to three persons were involved in the incident, and a hammer was recovered in the crime scene. SM Mall officials said the police are now on top of the situation and that no one was hurt in the incident. “There is a ‘Martilyo Gang’ robbery in a store in North EDSA. The police are on top of the situation and handling the matter. No one was hurt. The only weapon used was a martilyo. The mall remains open,” the statement said. The area where the suspects smashed a jewelry display, however, remained cordoned off for investigation. In a radio interview by DZMM Dr. Babes Arce said she and her family were in the second floor of the mall when they heard gunshots from the ground floor. In another DZMM report, Arch. 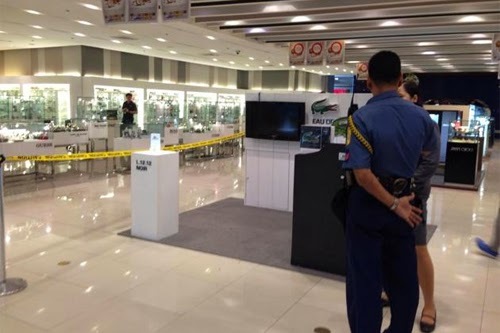 Rene Bacani, assistant vice president for operations of the SM mall clarified that there was no gunshot and that what the shoppers heard was the sound of the hammer smashing the jewelry display. This is not the first time that a robbery occurred at an SM Mall. Earlier this year, at least 4 to 5 suspects robbed F and C Jewelry Store located at the ground floor of SM Megamall. SM Malls had also vowed to enforce security measures after a shooting incident occurred inside SM North Edsa a couple of years ago. On September 13, 2011 Shiela Macapugay, shot her husband Abel who was working as a sales clerk in SM Homeworld located at the lower ground floor of the said mall. Security guard Ricardo Inamac was also killed after he tried to stop Macapugay from killing herself.